I believe firmly in sewing controlled weather…if I start sewing for summer, it will TURN INTO summer, right? It’s a theory of weather management that’s never failed, so since I’m officially tired of winter, I decided to start sewing rashguards. ….and I wasn’t about to break the tradition just because my boys are turning into giants- I just needed to get more creative. 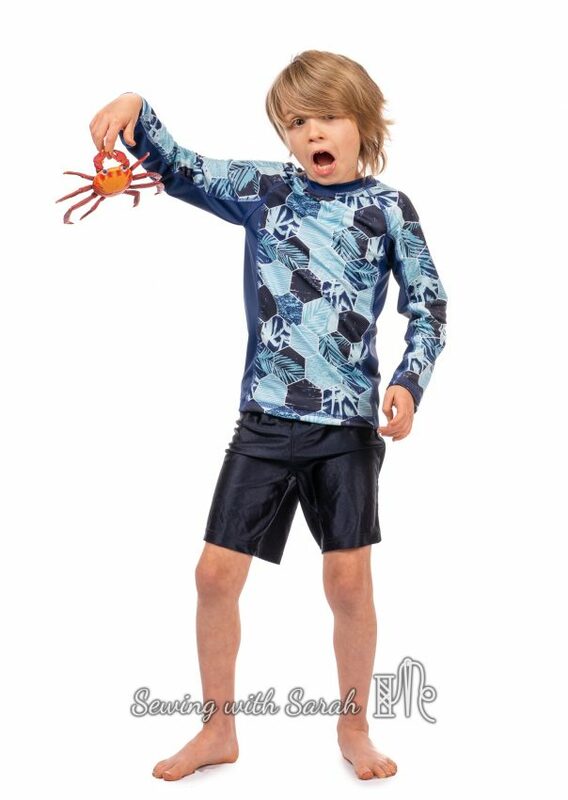 I had some promotional swim fabric from Peekaboo Fabric Shop, and ordered a solid navy to coordinate, hoping I could still use the two yard combo to eek out two rashies instead of one. 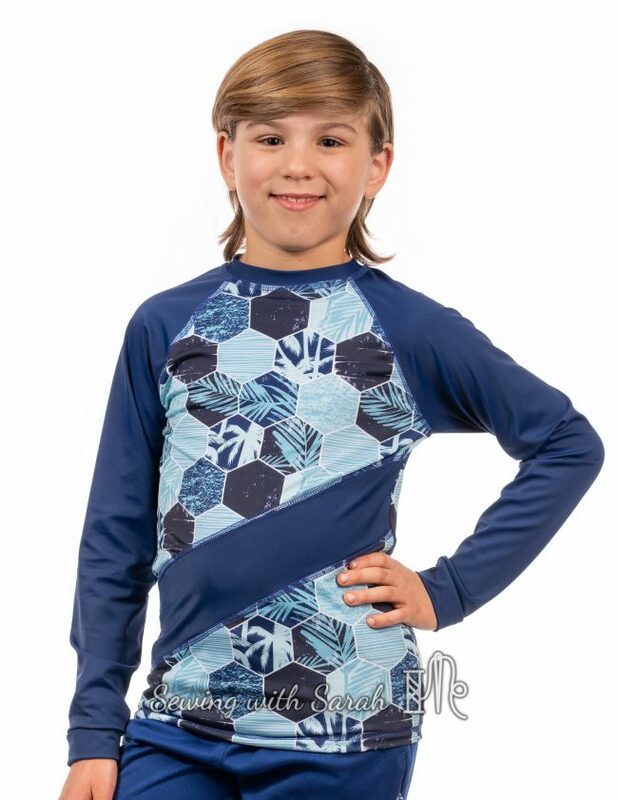 Last year, I used the Jalie Nico pattern, but I wanted to try something different, so I grabbed the Peekaboo Hang Ten Rashguard pattern and went to work. The thing I love about Peekaboo patterns for my kids is that they are incredibly consistent- I can apply their ready to wear size to any of the patterns, and come up with something that fits, without even bothering to try to get them to stand still for measuring. 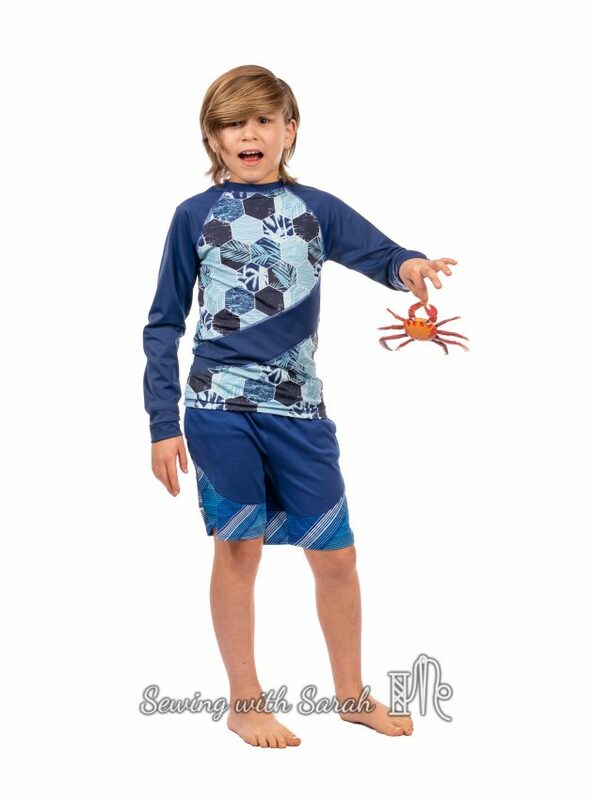 I cut the first rashguard, for Oliver, from the color blocked view of the pattern. I was a little anxious bout getting all the pieces to line up, and didn’t read the instructions carefully enough to ensure that I sewed the sleeves on correctly, resulting in a few choice words and some seam ripping, but in the end, it all went together really well. Unfortunately, even the color blocked version wouldn’t be economical enough on fabric to accommodate the size 10 I would need for Noah, so I decided to do a little extra hacking of my own, cutting the front piece from View B into three pieces, with a diagonal solid across the front. I highlighted my “design feature” with some extra reverse coverstitching (see the video tutorial here), and voila! Another rashguard was born, with only a few measly scraps to spare. I also added cuffs to his version, since this kid has monkey arms and grows about a mile a minute. Duuuudddeee…when did he start looking so grown up? The windy days (and some stuffy noses) meant we needed to shoot our photos inside, so we had a little fun with some props. Big shout-out to hubby, who’s really getting the hang of indoor lighting and photography- it feels good to be freed from the mercy of the elements when we need to take photos (I’m still counting on better weather soon though!). 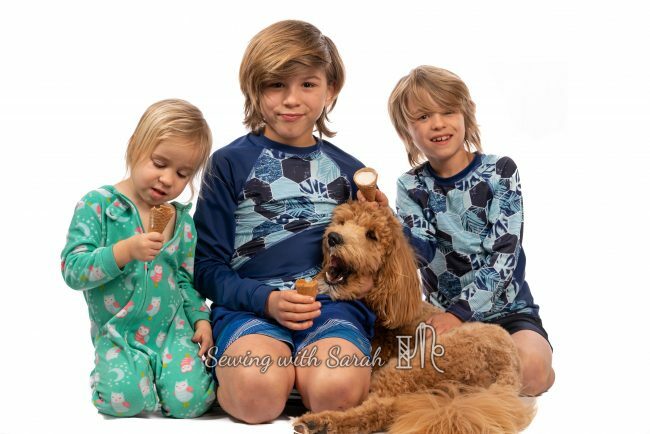 Predictably, princess was a little miffed that A) she hadn’t received a rashguard and B) her ice cream cone was proportionally smaller than her brothers. That look showed when we allowed the three of them (plus the dog) to pose themselves toward the end of the photoshoot. 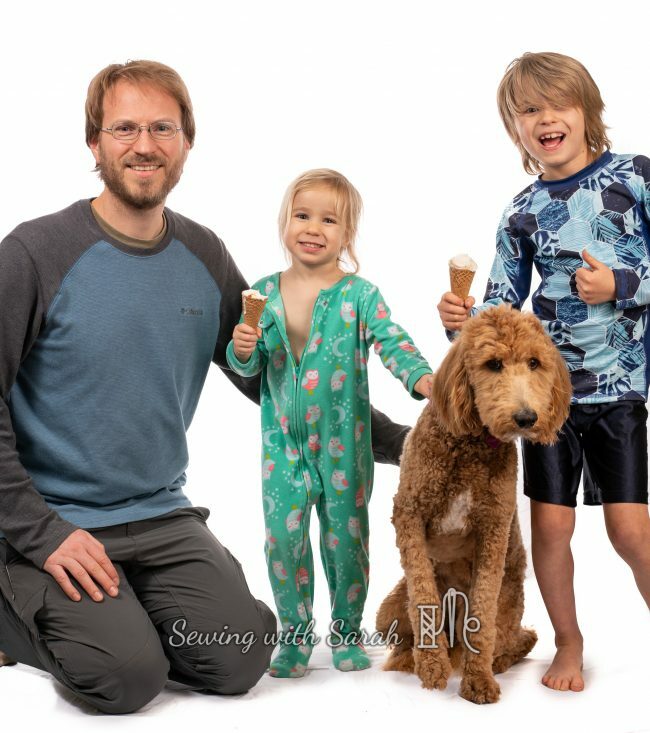 If you look carefully, you can see Oliver (far right) giving the dog an “Ice cream cone unicorn horn”, while the dog takes advantage of the distraction to take a chunk out of Noah’s cone. I couldn’t have orchestrated a better photo that shows their personalities (or the chaos of life with three kids and a dog). If you’re in the mood to sew some swimwear, check out the current preorder here. 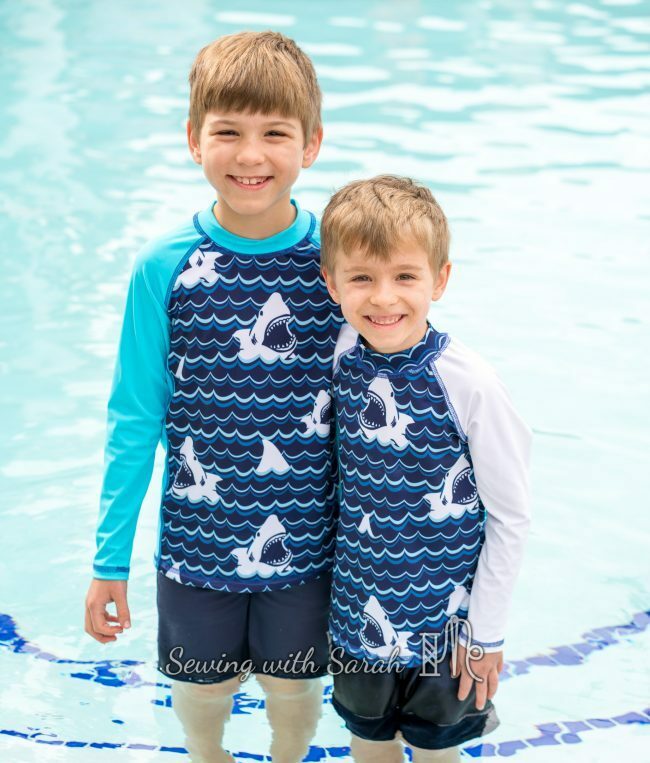 If you’re new to sewing with swim fabric, I have a whole post on getting started here! It gets a big thumbs-up from my kids! I have yet to sew up anything swim related but it is on my list to try this spring. I willed in warmer weather with a few sewing projects this month and we got a blizzard, so it doesn’t seem to work for me.